Ok, so we are here with short update on Apple iPad jailbreak, If you remember few days back we had reported about Spirit userland jailbreak port to iPad by Comex where we did raised the question about iPhone Cydia on iPad. Well it seems we have answer to that question now. 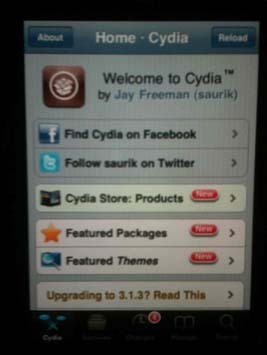 Cdevwill (Will Strafach) iPhone hacker just tweeted about Cydia up and running on iPad. We don’t have exact details like, it that modified Cydia for iPad or its iPhone version of Cydia. Two other iPhone hackers saurik and DHowett has helped cdevwill in porting Cydia for iPad. Cdevwill has said that he will post video and clearer pictures soon. P.S Saurik is the man behind Cydia for iPhone & jailbreak tool for iPad are not yet available. Amazon hops on the iPad Bandwagon- Will Apple Allow it?